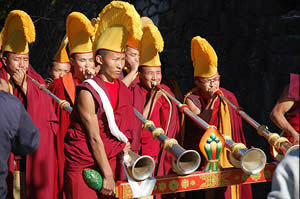 As people gather in the courtyard of a monastery the pipes, cymbals and drums begin to play. 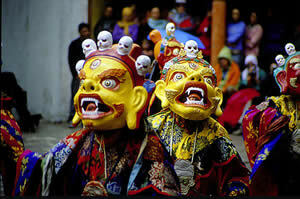 Then the monk dancers appear clad in flowing robes wearing the wild, colourful masks with fierce faces and weave their magic. The Chaam dances at the monasteries are unforgettable experiences. 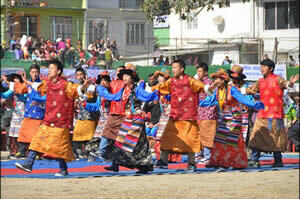 Chaam Dances are held every year in all the monasteries. During these performances masked monks wearing elaborate and colourful costumes dance to the beat of giant cymbals and horns. Chaam dances are considered a form of meditation, as an offering to the gods and as a way to teach people the importance of Buudhist values like compassion. Some dances depict the life of Padmasambhava or Guru Rinpoche and other famous Vajrayana teachers. Below are the dates of the religious masked dances called Chaam. 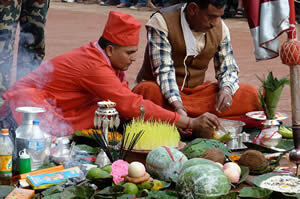 Held in January this week long festival celebrates the sankranti of the Hindu month of Magh. Fairs spring up everywhere as people take a bath in the rivers Teesta and Rangit. One of the biggest celebrations is in Jorethang in South Sikkim. 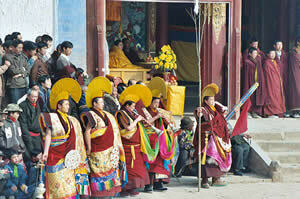 In January, the Tibetan New Year is celebrated all across Sikkim. 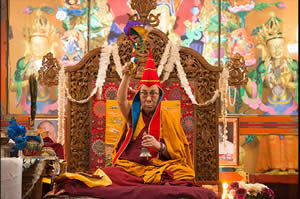 It is celebrated on the first day of the first month of the Tibetan calendar. 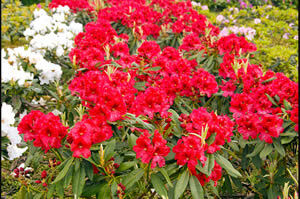 In March the three day festival is held at Dentam with a display of flowers. 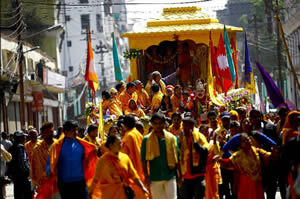 In March / April Lord Rama’s birthday is celebrated by the Nepalese community with prayers and visit to temples. In April this festival heralds the spring season and the Nepali New Year with cultural programmes and traditional festivities. It is the holiest day of the Buddhist calendar. It is celebrated on Buddha Purnima in May on the full moon of the fourth month of the Tibetan calendar on the day of the birth of Lord Buddha. He also gained enlightenment and achieved parinirvana on this day. DRUKPA TSHECHI: In July this day marks the first preaching by the Buddha at Sarnath. 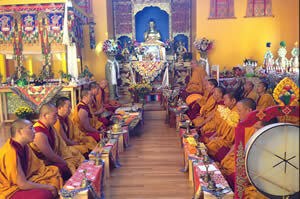 Prayers are conducted at the monasteries. in July the birth of Padmasambhava or Guru Rimpoche is celebrated with prayers and visits to monasteries. also known as Durga Puja it is celebrated for ten days in October when the goddess Durga is worshipped. The last day of Vijaya Dasami also marks Lord Rama defeating Ravana. 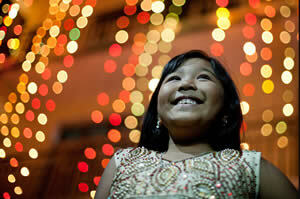 In November, a fortnight after Dasain is the festival of light called Tihar and also Diwali. People decorate their homes with lights and burst firecrackers. In December people celebrate the end of the harvest season in the tenth month of the Tibetan calendar. 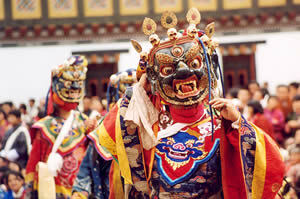 At this time there are the famous religious masked dances called Chaam at Enchay monastery.